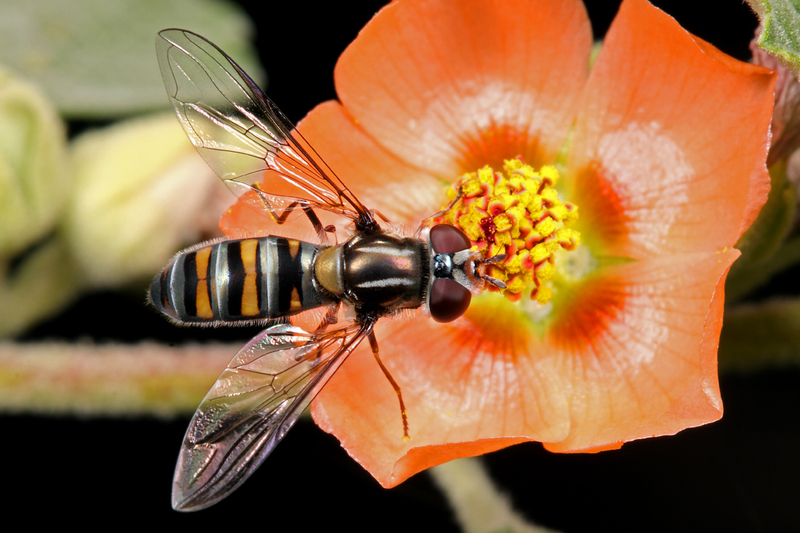 I’ve mentioned before my reluctance to take random “bug on a flower” photos, but the colors of this hover fly (family Syrphidae) and the mallow flower (Malvaceae, possibly Abutilon pauciflorum) on which it was sitting were enough to capture my interest—a rare offering from this blog to dipterophiles. Even though I’m a beetle man, I’ve had reasonably good success identifying the varied insects across several orders and families that I’ve photographed at the Reserve. This one, however, has me a little stumped. 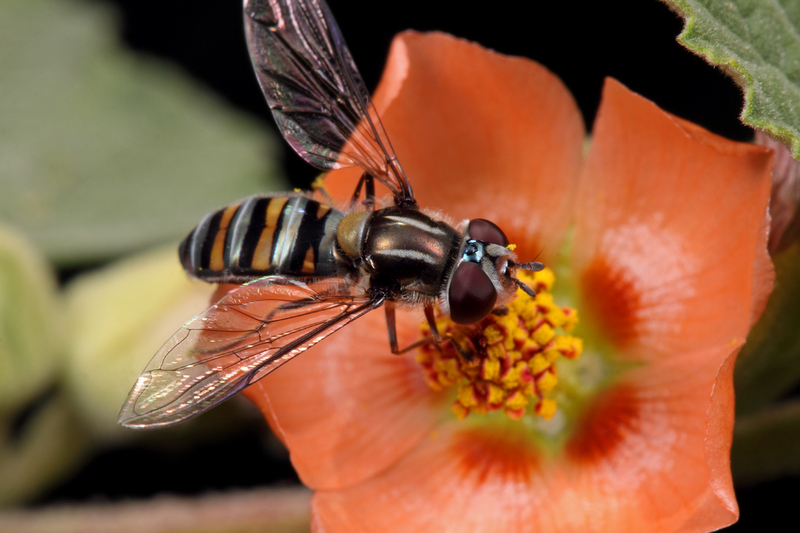 I searched the syrphid gallery at Diptera.com but didn’t find a good match, the most similar being the Old World species Episyrphus balteatus. My best guess is something in the tribe Syrphini. Morgan? Keith? Phoridae? Photographed last month at Reserva Ecológica Costanera Sur in Buenos Aires. This entry was posted in Diptera, Syrphidae and tagged Argentina, entomology, flies, insects, nature, science, wildflowers. Bookmark the permalink. Similar, but Erisyrphus is an Old World genus, and E. balteatus in particular is distinguished by secondary, ‘moustache’-like black bands on the 3rd and 4th abdominal terga. Nice to see another fly on BitB! I just went through our entire Neotropical syrphid collection and didn’t see an exact match for this specimen. My best guess is a species of Toxomerus (there are reportedly more than 144 species in the Neotropics according to Chris Thompson in MCAD), but beyond that, I’m not sure. I’ve sent the post to our resident syrphid workers to see if they can pin it down further! Thanks Morgan. Here’s another view of the fly in case it’s helpful (exposure a tad bit harsher). Another nice picture! Unfortunately the characters needed are on the lateral and ventral portions of the thorax, so unless someone with more syrphid gestalt skill than I shows up, you might be stuck. My lab mate suggested either Toxomerus or Allograpta as possible IDs. Both are fairly diverse and relatively understudied (for syrphids at least). Here’s a key to Allograpta subgenera if you’re interested. The whole Bug-On-Flower thing is tough. It’s the insect photography equivalent of sunsets on the beach. Yeah but … It’s not always about art. A request for identification is always better accompanied by any focused picture one can get. Bugs-on-flower pictures are very useful if you are interested in pollination ecology or conservation of pollinators. I’m glad you like chasing tiger beetles and borers, but I like having a record of who has been visiting whom. I don’t talk about it much on this site because it doesn’t lend itself to photography, but a major focus of my research with woodboring beetle concerns their larval host plant associations. Drawing connections between organisms is cool. Ahhh, this is a tricky one… looks like Episyrphus, but it is kind of atypical Ocyptamus – in fact it is O. diversifasciatus! Nice pic!! Gracias por identificar la flora. Como se distingua Abutilon y Sphaeralcea? Hola Ted. En esta región, las dos especies de Abutilon tienen flores de color amarillo-anaranjado. La Sphaeralcea más abundante aquí tiene flores de un típico color rosa salmón o minio. Quedo a su disposición.